Aaron Davis of Apple will be the featured speaker, covering the Mac's newest operationg system: Mac OS X 10.7 Lion. Aaron brings a wealth of experience and knowledge about all things Apple, so bring you questions about Lion and anything else. The meeting will begin with a Questions and Answers session followed by a short Back to Basics tutorial then a quick session of club business before our usual coffee break after which the main presentation will commence. A sandwich lunch will be served for those who are sticking around for the Mobile Lifestyle SIG, which begins immediately after the lunch break. 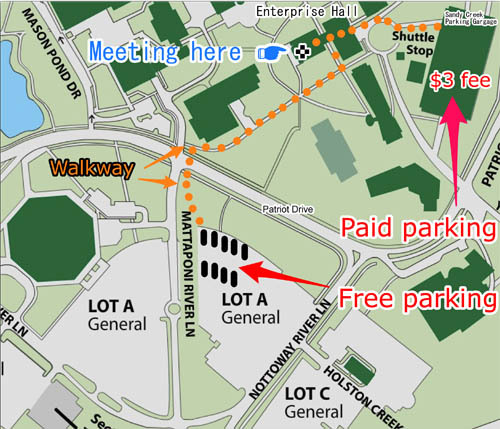 August's meeting will be held at our usual location, the Enterprise building, Room 178 on the George Mason University campus in Fairfax VA. Check back closer to the meeting date for any updates or changes. Important notice: The main presentation by Aaron Davis will not be streamed live over the Internet. Only the earlier Q&A session will be available on the Pi's Ustream Web page.